From the land of strawberries, here is yet another farm that offers them a tete-a- tete with this heavenly fruit. What makes this farm an important one to visit is that it is one of the largest strawberry farms in Cameron Highlands. Moreover, there are many features in it making it more alluring. There is a vegetable market, a shopping gallery, a vintage cafe and pastry corner that form a part of this farm. Here, you can pick your best strawberries and relish them. 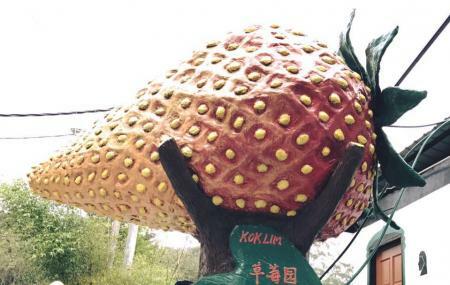 How popular is Kok Lim Strawberry Farm? People normally club together Cameron Highlands Trail No. 9 and Big Red Strawberry Farm while planning their visit to Kok Lim Strawberry Farm. You can pick the strawberries at the strawberry farm after you buy the tickets from the basement counter. For 2 persons, it is RM40 (the weight of strawberry that you can pick is 500g) per entry; for 3 persons, it is RM50 (the weight of strawberry that you can pick is 800g) per entry and 4 persons, it is RM60 (the weight of strawberry that you can pick is 1 KG) per entry. If the strawberries that you picked are overweight, you will need to pay RM5 per 100g. After you pay for the strawberries, you can enjoy some strawberry juice at the ground floor counter. There are also some other shops besides the strawberry farm. You can have a taste on different varieties of honey at the Melipoly enterprise Sdn Bhd. Steep, uneven concrete paths and steps. If you slip you might have a nasty fall. Not many nice strawberries to pick. Not recommended.